After she had released her first album, Jeritree’s House of Many Colours (1978), within which she had interwoven a series of songs expressing woman, in the first person, as fertile, spiritual, intuitive, and passionate overseer of life and death forces, Jeri Hilderley felt ready to compose and perform a longer work for voice, guitar and marimba. Then in 1979, her longtime good friend, Konstantinos Lardas, Pulitzer Prize nominee Greek poet and professor at City College of New York, gifted her with the manuscript of his translations from the original Greek of her beloved Muse, sharing her living spirit through his impassioned translations. Jeri too was ready to relish Sappho’s poetry and sing it back to her. Time Traveling with Sappho; A Love-Song Cycle is an amalgamation of two versions of the song cycle: one hand-scored, performed and recorded in the late 70s; the other Finale-scored, and recorded through Pro Tools in 2014 and 2015. 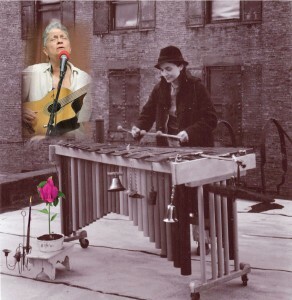 The earlier version features Jeri’s 40 year-old singing voice as she played marimba and acoustic guitar. The present version has her 77 year-old voice, accompanied by acoustic guitar, electric bass, key-board generated pan flute, organ and harp, with embellishments of finger cymbals, and children’s voices. These two versions of the song-cycle are interwoven, in a palimpsest layering, sometimes heard simultaneously and sometimes having their own space-time prominence. Her partner, bassist Janet Mayes, and Jeri rehearsed and massaged the new version until the songs became incantations, spiritual renewals, hallowing out a meaningful, deep space within and around them. Addendum: An early version of Sappho’s poems set to music by Jeri is in the archives of WBAI’s series of woman’s music programming, Songs of Sappho’s Daughters, performed and recorded on July 16 , 1974. The series was “devoted to Lesbian poetry and music, featuring poets, composers, and performers. The series was hosted by Manya La Bruja, nicknamed the “Classical Amazon”, and Ms. Mark Giles, and aired on WBAI in 1973 and 1974” (Pacifica Radio Archives). “Episode of Songs of Sappho’s Daughters, featuring Jeriann Hilderly [sic] performing music. Opening and closing theme songs by Flash Silvermoon. Produced by Mark Giles with engineering by Peter Zanger and David Rapkin” (Pacifica Radio Archives).